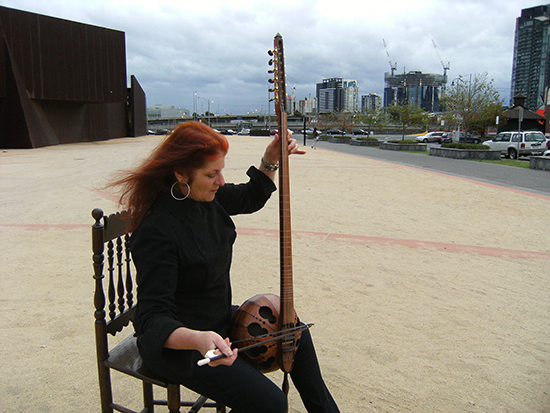 Ros Bandt’s tarhu—a handsome, long-necked East-West hybrid stringed instrument which can be plucked or bowed and has resonant sympathetic strings—is the artist’s means for conjuring a cogent, sonically immersive world view which draws together voices human, animal, instrumental—lyre, harp, viola da gamba, shofar—and electronic. Hence the title of this two-CD set of works made across the last decade: Tarhu Connections. 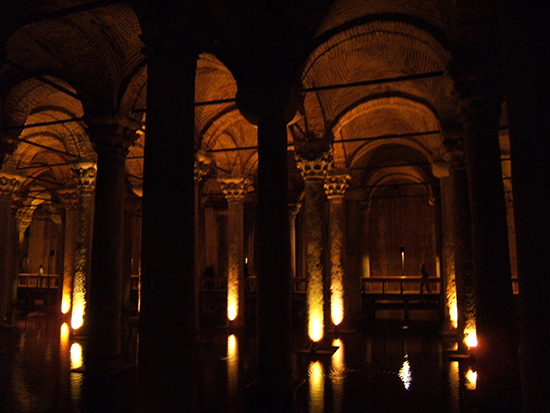 Above all, player and tarhu are always in the world—an ancient cistern beneath Istanbul’s Yerebatan Palace ringing with dripping water, the talkative streets of Hania in Crete, a rural path along which goats trot, their bells tinkling, a room in Venice where the sound of rain accompanies softly plucked strings. These sounds and spaces are heard on the set’s first disc, Mediterraneo, in which a sense of cultural preservation dominates—of ancient towns and fields, the Greek lyre, Hesiod intoned, a shepherd’s flute, a lullaby—but with a sense of continuity. A modern poet reflects on the persistence of the spirit of a neolithic goddess as a fierce wind whips about and, in a piece of high drama titled Four Murders in Four Minutes, Bandt apocalyptically evokes Medea via amplified tarhu and electronics (Jon Drummond)—tarhu groaning, mad chatterings, distant cries, high bells, a great wave of sound and a gasping sense of air sucked out of a cavernous space. “From the Shofar,” which “mourn[s] the desperate plight of the dispossessed Jewish culture over millennia,” was recorded from within the ram’s horn, yielding a thunderous soundscape through which the tarhu empathically grinds and growls. These bursts of passion in an otherwise contemplative disc foreground the darker energies of the Mediterranean. Change too is noted: shepherds no longer play flutes (but Bandt does). On the final track, once the goats, now frisky, have been fed, the sound of their keeper’s SUV is heard roaring off into the distance. Throughout, the tarhu is an eloquent full-throated voice and harmonious partner, capable of diving to remarkable depths, gliding high or gently droning, always soulful, enhanced by resonant settings like the Yerenaten Cistern (harp and tarhu dialoguing) or merging with a density of sounds—walkers and talkers, a band, a priest, pigeons—in ancient streets. Mediterraneo exudes a sense of wholeness, of a shared journey and commitment to cultural preservation, in a very contemporary way, with an instrument that is a modern hybrid (invented and crafted in Australia by Peter Biffin) of the Turkish tanbur, the Persian kamancha, the North Indian Vina and the Western violin and double bass—alongside soundscapes and electronics. Pacifica, the second and more diverse disc of works, offers a quite different experience with its focus on protection of the environment and collaborations with Asian musicians. “Silk Bamboo Wind” is an immersive constellation of notes—from tarhu, psaltery, Vietnamese zither and recorders—jangling and tumbling as if in a state of restless suspension through which bird-like creatures fly. In “Sheng and Tarhu in the Bush,” the always impressive Chinese Sheng mouth organ, played by Wang Zeng Ting, engages lyrically in shared and overlapping short and longer phrasing with the tarhu. Recorded in Victoria’s Goldfields, it recalls the Chinese presence during the 19th century Gold Rush, which is also evoked in “Fields of Gold,” a melancholy response to tombstone texts underpinned with insect clatter and briefly interrupted by a burst of kookaburra laughter. Animal life figures strongly in Pacifica, Bandt, performing in “ancient acoustic habitats” (in Delphi and a Victorian forest), plays tarhu and Greek lyre, lovingly duetting with recorded lyrebird song. “Rapturous” is “a fast ride with an eagle” in the US: “the granulated eagle calls are stretched to represent the psycho-perceptual orientation of the eagle, solitary, looking down over the land.” Tree life is also intriguingly acknowledged in “Rimu,” the tarhu singing delicately with the burblings high and low of an ultrasound recording of one of New Zealand’s ancient native conifers (they can live to 1,000 years). Pacifica’s moment of drama comes in the form of “Stranded on Ice;” the context, Global Warming; the instance, polar bears’ loss of habitat. Jim Atkins’ electronics and Bandt’s raw tarhu bowing in widely spaced strokes and her use of randomly precussed glass, generate a nightmare world populated with feral cries in a vast directionless space. The disc ends serenely with “Windharps remix,” nine harpists playing Australian-made instruments recorded in wind, variously in Istanbul, Lake Mungo and Kyneton. The tarhu flies contemplatively amid murmuring voices and cascading harps, as if to play forever. With its sense of the weave of time, culture, nature, it’s a signature conclusion to Tarhu Connections, a CD set that embodies Ros Bandt’s distinctive commitment to elaborating a musical, cultural and environmental world view with ancient practices sustained and renewed through cross-cultural collaborations. You can hear Ros Bandt talk about Tarhu Connections and listen to excerpts from the discs here and here. Ros Bandt, Tarhu Connections, Hearing Places. All profits from the CD sales of Ros Bandt’s Tarhu Connections go towards educational programs for refugees in the Young Citizens of the World program, in Hania, Crete. For more information, please visit the Creative-Intercultural-Dialogue website.